Akurateco’s invoicing enables businesses to get paid faster, reduce time spent on creating and sending invoices, and look more professional to their customers. Manage your invoicing needs in just a few clicks. Invoicing is time-consuming, so we automated it for you. 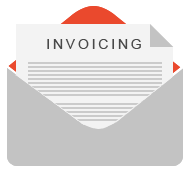 You are able to select one of our invoice templates, add your logo, and send your customers an email invoice. On the basis of our reconciliation tool invoices are automatically created as well.